Tuscaloosa. 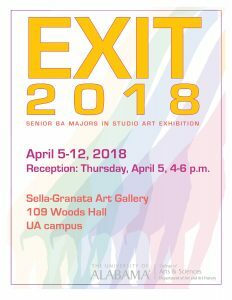 — The University of Alabama Department of Art and Art History is pleased to present EXIT 2018, our annual senior exhibition for BA majors. The exhibition in the Sella-Granata Art Gallery runs April 5 through April 12, with an opening reception for the exhibitors, Thursday, April 5, 4:00-6:00 p.m. Join us for Art Night on Woods Quad with this reception and a second in our Sarah Moody Gallery of Art from 5:00-7:00 p.m.
UPDATE: Students whose work will be included in the exhibition are Lisa Meister, Emma Heussner, Elizabeth Coleman, Rebecca Skipper, Chelsea Parrish, Nicole Mendez, Ari Barley, Alana Cammack, Drew Kemmerly, Macgill Webb, Rebecca Powell, Zack Dailey, Brianna Bolton, Mei Ray and Megan Fletcher. For more information about the Bachelor of Arts degree in studio art and our other degree programs in the Department of Art and Art History, go to http://art.ua.edu/academics/undergraduate-programs/babfa-in-studio-art/ or contact the department at (205) 348-5967. Funding support for the Sella-Granata Art Gallery comes from the UA Department of Art and Art History. Admission to the gallery is free. The gallery is located at 109 Woods Hall in the heart of the UA campus on Woods Quad. Hours are Monday through Thursday 10:00 – 4:00 p.m. Contact the gallery at (205) 348-2783 or go to http://art.ua.edu/gallery/sgg/. Woods Quad and Woods Hall are a five-minute walk from the Campus Drive Parking Deck and Bus Hub on Hackberry Lane. Information about visitor parking is available here: http://bamaparking.ua.edu/visitor-information/.